In previous posts I mentioned my trip to Germany to visit SieMatic’s factory and see the latest products which I will be working with and placing into showrooms around the world in my job as Consulting Studio Developer. 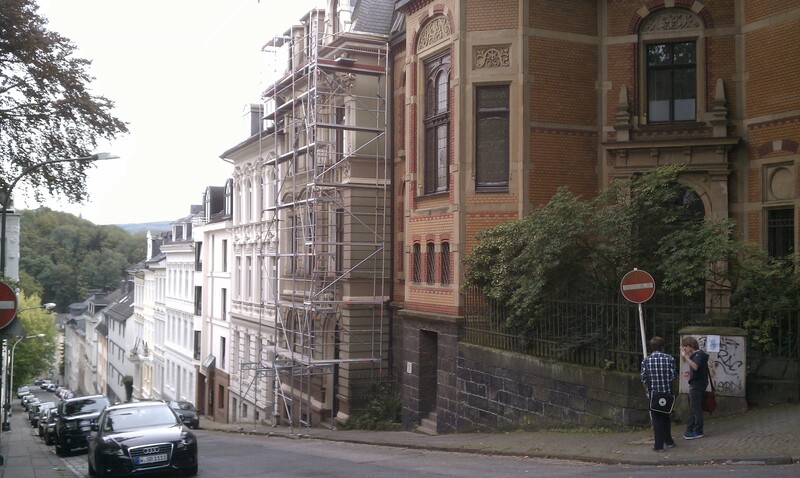 The real reason I wanted to go to Germany, however, is to finally take some time out to visit Wuppertal. 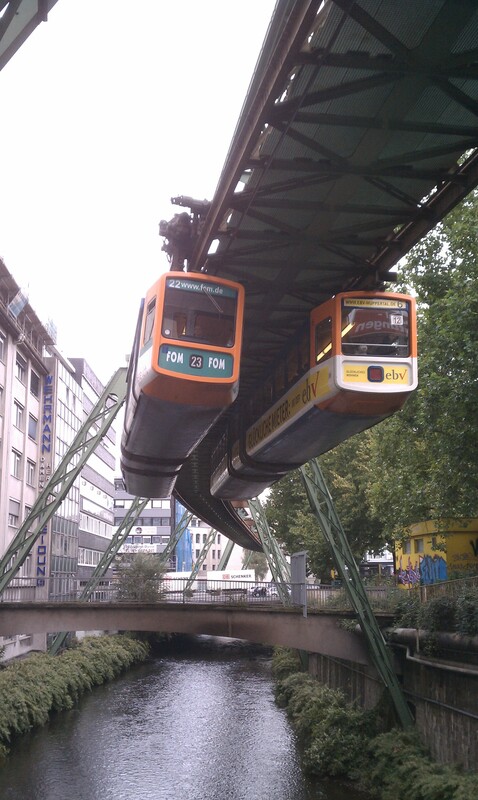 I don’t remember how I first heard about the Schwebebahn. I might have been up late hitting the “random article” button on Wikipedia. More likely than not, I was probably looking at a timeline of transportation milestones since I spend lots of time looking at engineering and architectural history. What is certain, however, is that I knew right away I would need to make a pilgrimage to ride this transportation anomaly. 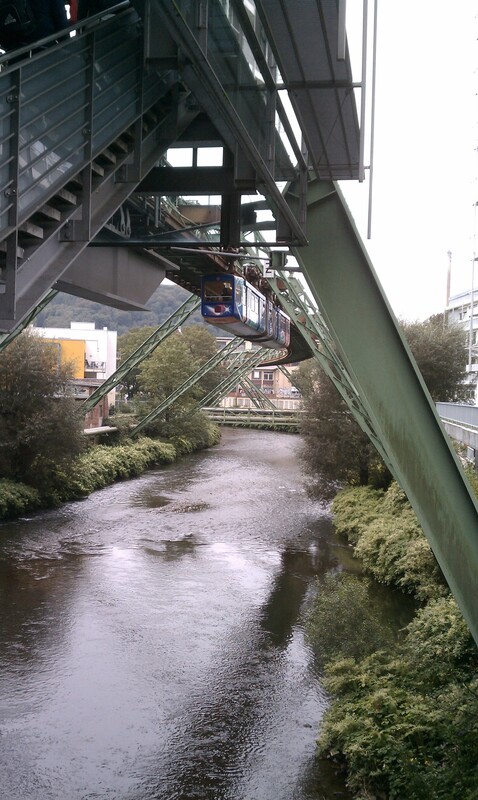 Because of the extreme hills on either side of the Wupper river, the city decided to run a train line above the river. 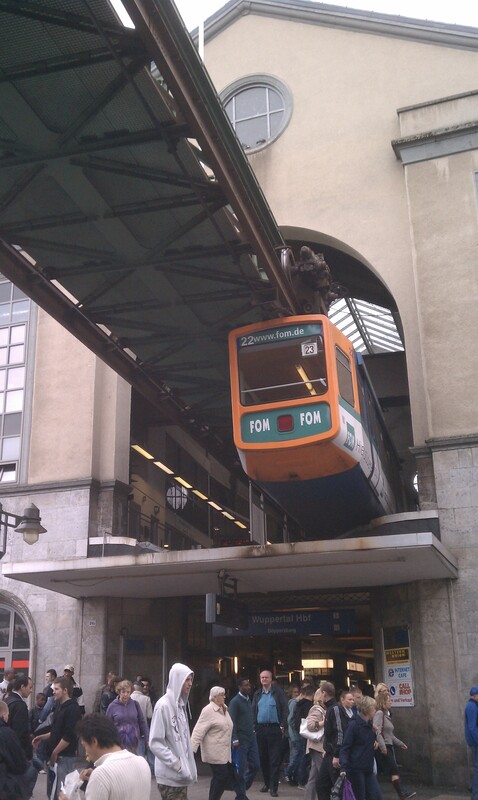 Designed by Eugen Langen originally for a site in Berlin, it ran its first tram in 1901. The entire route is about 8 miles long, mostly over the river but with the extreme southwestern section over the high street and at one point crossing the A46 Autobahn. 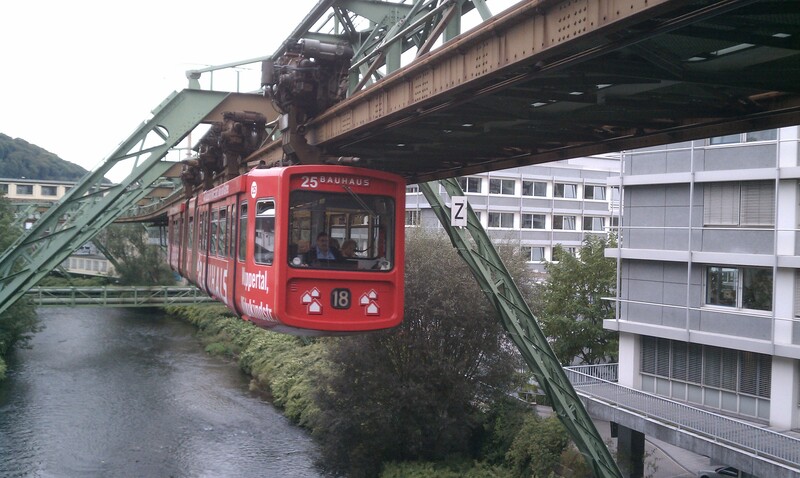 The trams float about 12 meters (39′) above the river, and travel at a maximum of 60 KpH (about 40mph). 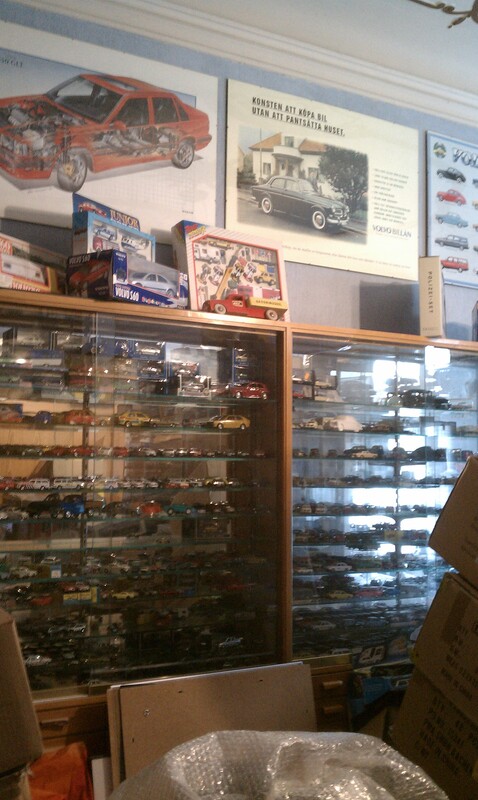 Underway, you can feel the hanging car gently banking in the turns. Its a sublime experience and every transportation/engineering fan should go for a ride. There is a seat right up in front, directly behind the driver and this is the seat you will want. The two pictures above show some of the character along the river Wupper. 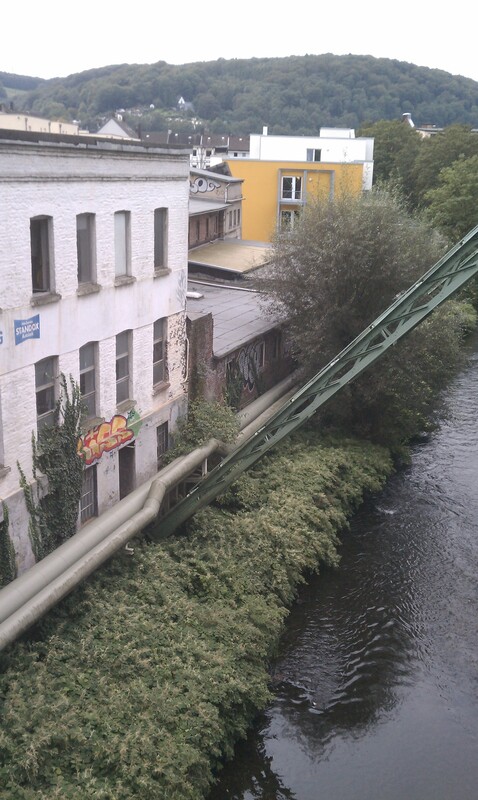 Bayer aspirin was invented here in the mid 19th century, and the Bayer company was originally headquartered along this river (the former picture shows us crossing the extant Bayer plant with the modern piping crossing the river between old plant buildings). The dramatic valley geography, however, contributed to the city’s downfall in prosperity. Before the monorail was even finished, Bayer started building its enormous factory town Leverkusen on a flat piece of land in the nearby countryside. Throughout the 20th century, Wuppertal’s businesses left the beautiful valley. I felt a special kinship with this city, because most American cities went through a similar economic and social plight. 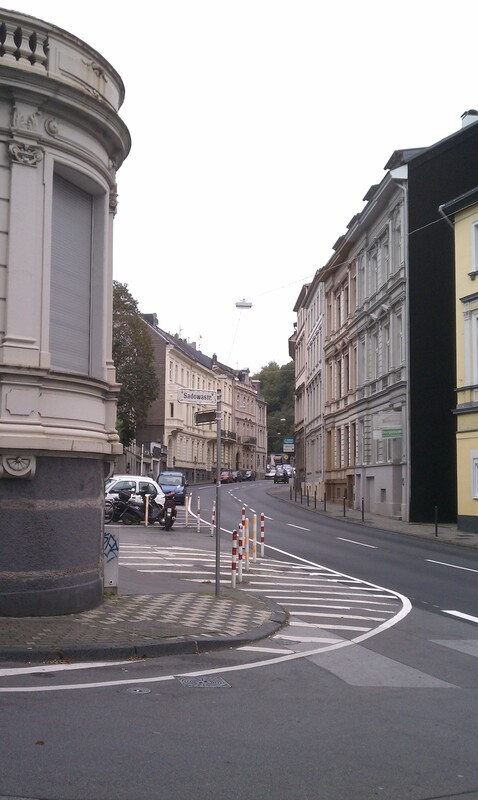 Wuppertal has a nice rough-around-the-edges feel. Today, magnificent street art adorns many of the abandoned-looking old factory buildings along the river. Appropriately, a rough and free music flourished here in the late 1960’s; founding European free-jazz pioneers Peter Brotzmann and Peter Kowald made Wuppertal their home, bringing in many of the biggest names to play with them in the now departed jazz clubs. 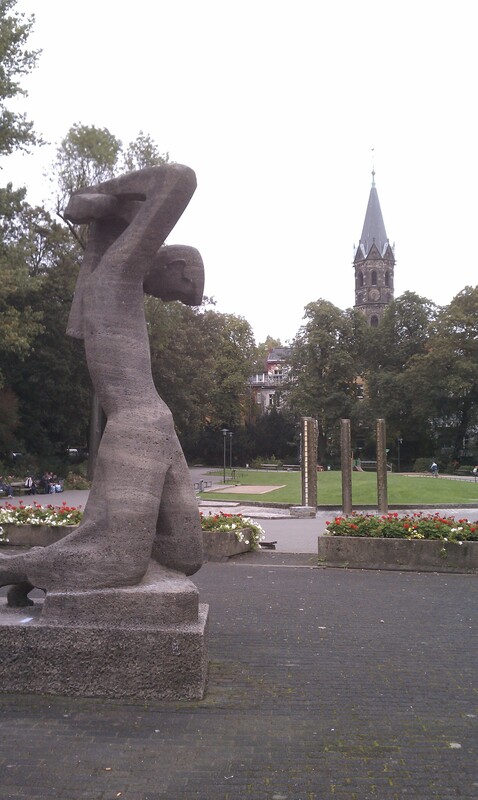 Brotzmann still lives in Wuppertal today. 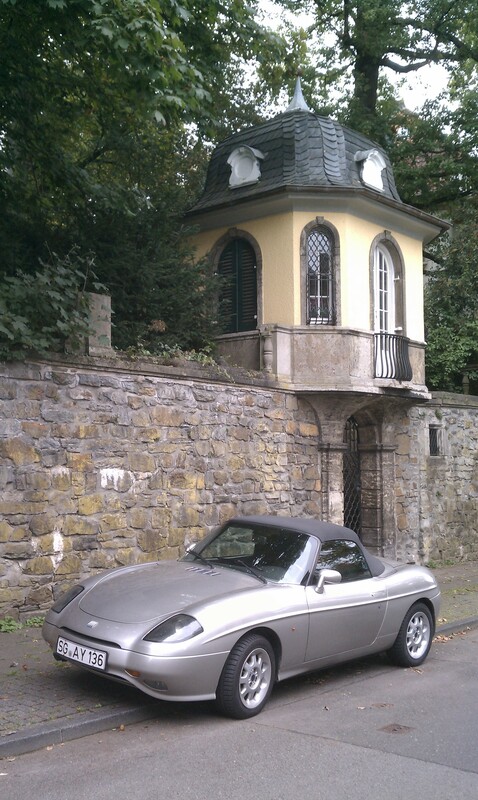 I wandered up into the hills of Wuppertal to see the magnificent 19th century homes and gardens. The rise of the valley is quite extreme, and the impeccable maintenance of the homes is at least as impressive as any large manor house here in Baltimore. The landscaping and streetscape in this neighborhood was one of the nicest I have ever experienced. The front garden walls are ubiquitous – one of my favorite types of sidewalk conditions. 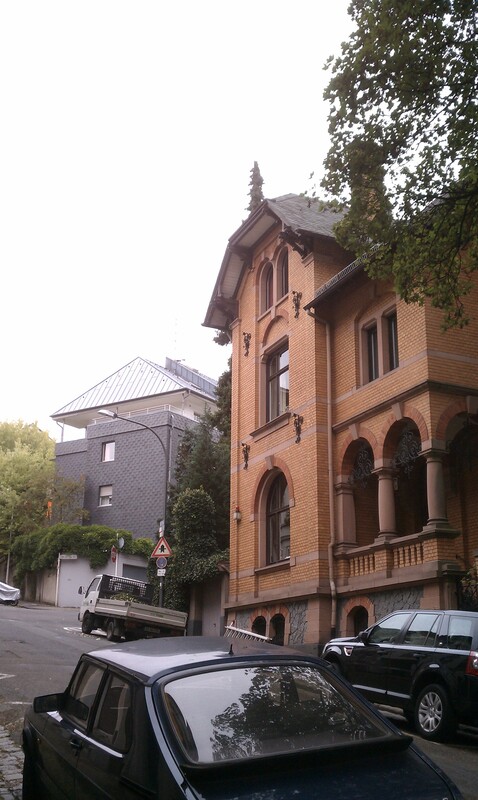 We are looking at one of the finest townhouse neighborhoods in 19th century Nordrhein-Westfalen. 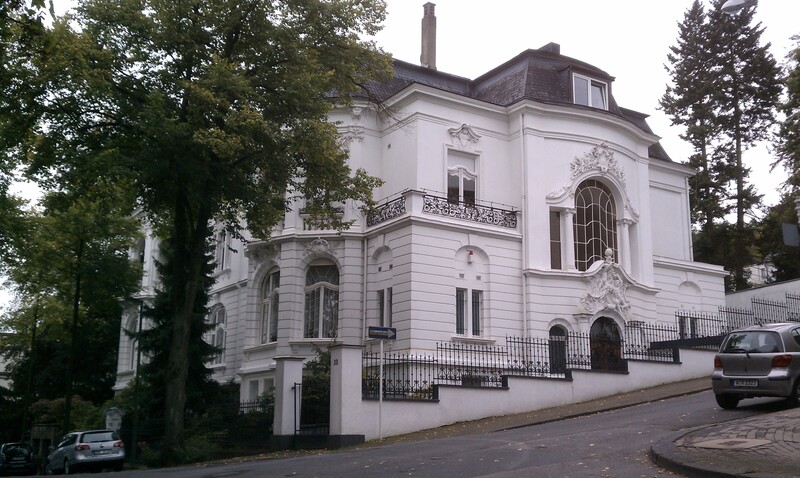 I have been to wonderful streets in Dusseldorf and Cologne as well – this is as beautiful. 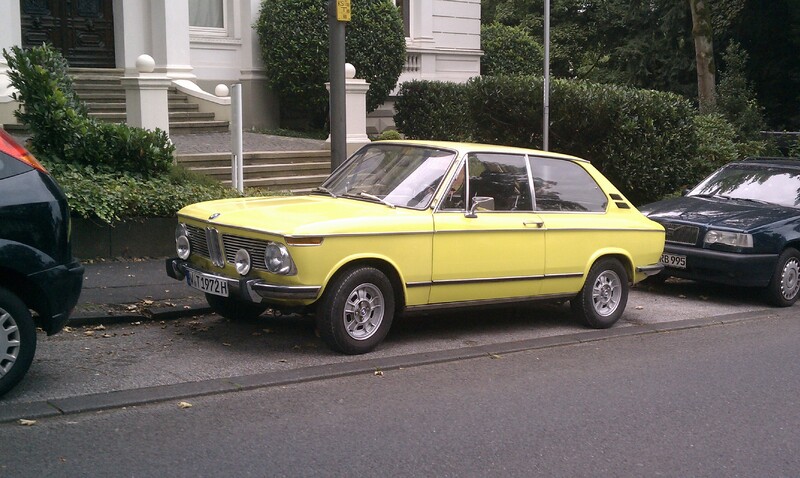 Right around the corner I spotted this massively rare, apparently daily-driven Golf Yellow early 70’s hatchback BMW 2002. 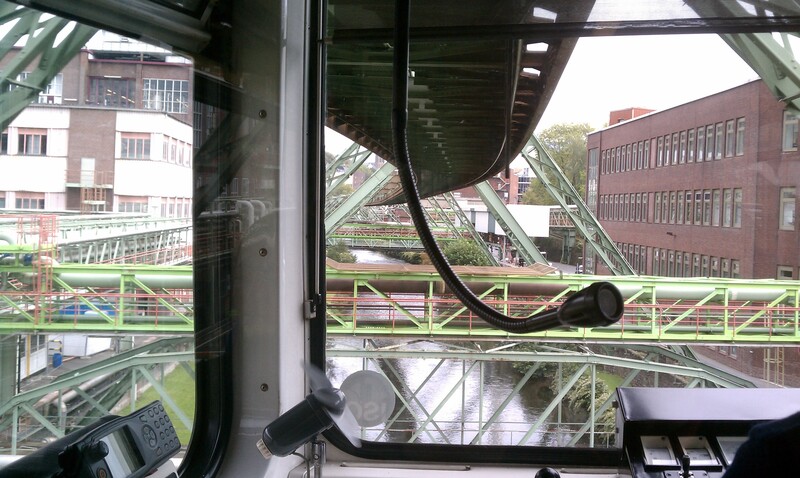 I took another short ride on the Schwebebahn and then headed to my ICE train back to Bielefeld to meet with my SieMatic friends for dinner. I wish I had taken more time to see the whole city, maybe search a little harder for the old music scene and take in the current trends in visual art. Well, I can say this, I will return to this lovely little place, with certainty.